With all the content I filmed during my work trip last November, this dining review has been on hold for way too long! 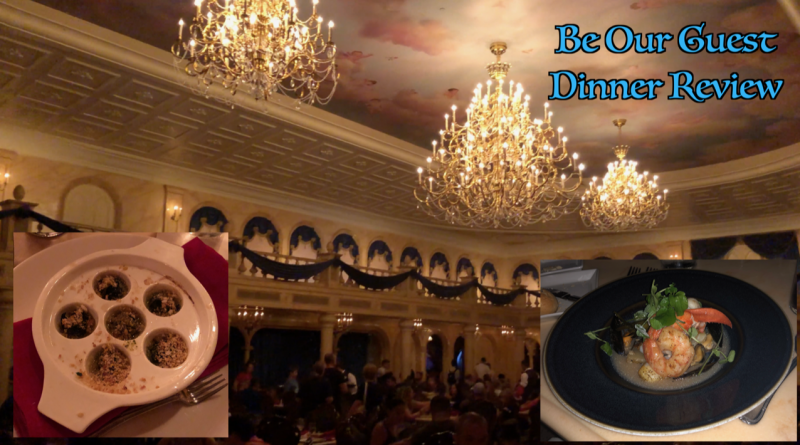 To see my experience with Dinner service at Be Our Guest, a restaurant located at Magic Kingdom park, click the video below! Have you eaten dinner at Be Our Guest? Did this video sway you one way or the other? Let me know in the comments! Thinking of a Disney Wedding? Does not seem worth the money at all. I wanted to love this. We did love meeting the Beast! The dinner itself was eh. My soup – French Onion – was delicious. My entree, the lamb, was undercooked even for lamb. The mushroom and beets(?) that came with it were barely edible. Loved the desserts. The service was mediocre. I wasn’t impressed, she was lovely but overworked, rushed and we got no actual attention. I couldn’t ask for anything or ask questions about the menu, etc. For the amount of money they know people must pay for that meal, they should have more servers. I’d go again but I’d hope for better service and order more carefully. It was still worth it for an “experience” in my opinion. I’m sorry you didn’t have a great customer service experience. My service was fairly standard and I didn’t have any complaints. Hopefully they’ve worked out the kinks since then! As far as my food, I think I would have enjoyed my appetizer had I picked one that I knew I would have liked (French onion soup, salad, etc.) For the sake of the video, I wanted to branch out! The main dishes do not seem very big. On our last WDW trip my wife and I focused more on dining experiences than we usually do. We loved the 50s Cafe at DHS and the French cafe at Epcot. The Brown Derby at DHS was sublime. And I scored us a breakfast at Cinderella’s Royal Table at MK, which we both enjoyed a lot. However, lunch at Be Our Guest was a letdown. Too much money for mediocre food and partial self-service (where the heck is the silverware…), and the Beast room underwhelmed as an experience. Maybe the dinner service is a step up, but based on our lunch I don’t see why Be Our Guest is considered a coveted reservation.